Mystery and intrigue abound as Emily and Matthew are trapped inside an unfinished escape room in the basement of Whits End. Meanwhile, the Odyssey High School Football team heads toward the state championship and deals with unexpected challenges. 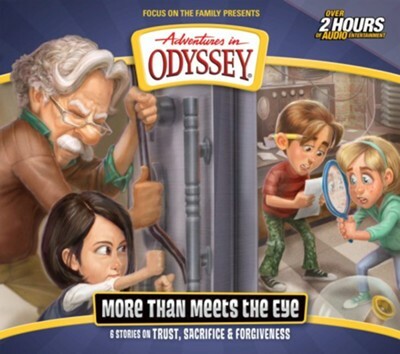 Created for ages 8 to 12 and enjoyed by the whole family, Adventures in Odyssey award-winning audio dramas teach lasting truths and bring biblical principles to life, with just the right balance of fun, faith, and imagination. The adventures often start with grandfatherly Mr. Whittaker (Whit), who runs an ice cream shop called Whits End. Young friends from all over town come to Whit for advice, and his employees (perky Connie Kendall and genius Eugene Meltsner) often learn as much as the kids! And Wooton Bassett, the zany, fun-loving mailman, helps the kids in his own unique way. I'm the author/artist and I want to review Adventures in Odyssey #67: More Than Meets the Eye.